several exercises on affirmative future. The last exercise may be written or oral. Keys included. You will have a very good fun, won´t you ? Here is the 2nd part of my document. 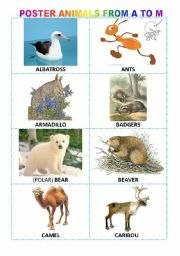 For each letter 3 animals as in the 1st part. Then 4 exercises (1 is about comparisons) and the keys are provided when the exercise is not too personal. This part is fully editable too. 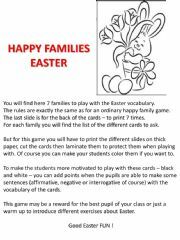 So you can decide to make memory and bingo games as for the 1st part if you want to have more material. Good fun ! an Easter story to read with a True or False exercise, then a turn this text into a comics and finally a short essay to write. 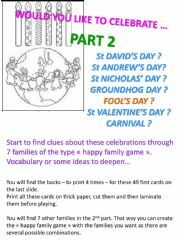 4 posters as rewards or for the classroom and for vocabulary about some well-known festive events. Keys included. Good fun ! I´ve just come back from the Cesar Ceremony and I´ve brought this exclusive interview ! A funny text to study the passive voice. An exercise of 20 active sentences to turn into passive ones. And an exercise to work in pairs. Reading, writing and oral are possible to work with this ws. Keys included. Good work ! history, literature, differents countries and men can be explained in a test from a wise ancient Lady. Check you know what Acqui is asking you. Good Luck ! 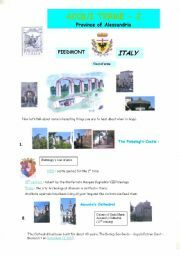 Lady Acqui Terme is happy to introduce you some of its monuments and San Guido, its Patron Saint. 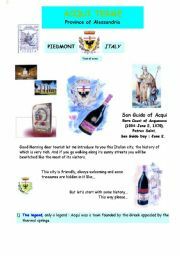 Follow the Acquesi in the streets on that special Sunday. it is always interesting to discover a town and its evolution into history. Here you will read about incredible steps among so many peoples... enjoy this trip ! Are you a good witness ? 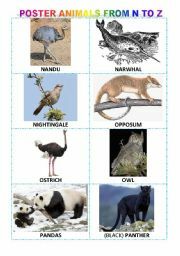 description - comparative and superlative and other exercises. Halloween is here ! Oral exercise. 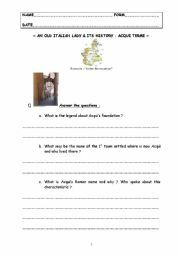 This file is to improve the oral skill. 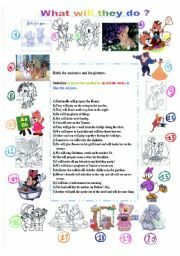 There are several sentences on Halloween characters or other details to make this exercise pleasant and funny. A poem (I wrote) ends this document. Good fun ! Happy Family Festivities - part 1 - 7 families. Happy Family Festivities - part 2 - 7 new families. 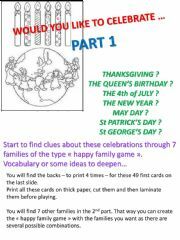 Here is a new series of 7 other families to complete a bigger game with several combinations. 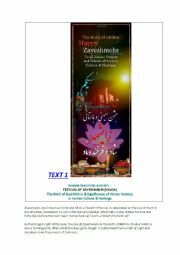 You will introduce new knowledge of the holidays in the world, in the UK as well as in the USA. Travel in a funny and pleasant way ! Good fun ! Jobs - some simple exercises. Here are some simple exercises for students end A1 - A2. 2 slides with matching exercises and a true or false. Happy learning ! Here are some jobs and occupations in alphabetical order from A to M as the 1st part on 2. You have some exercises and their key with the last slides. Good fun ! Here is the 2nd part of my document about Jobs and Occupations in alphabetical order. 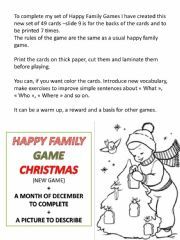 New exercises and a game, and their key are on the last slides. Good fun ! Let´s eat some good food ! 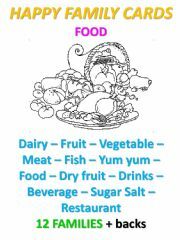 In this file you will find vocabulary about food (fruit, vegetables, general food and 2 typical expressions) with some exercises, the pyramid of food and a dialogue "Let´s go tho the restaurant !" and a funny surprise... Good fun !